I made this necklace with some of my vintage button collection. If you click on the image you will be able to see better the little round buttons, the rhinestone buttons, and at the bottom, I put a black glass button in a cabochon to make the charm. I stamped the word LOVE on paper and put it under glass in another cabochon. It fits this weeks Theme Thursday of "Hearts". I love making jewelry and as soon as my art room is all set up I will be making more. Today I am putting the last bits of supplies away in my room. My linen bins arrived and it was amazing how fast they filled up! Didn't I throw enough away??? I have a few more bins coming in the medium size and that will help with finishing up the job of organizing. I am planning to make some curtains and a chair cover, and I am scouting out a chandelier to shabby up for the room. It has been a lot of work, but I feel so renewed by doing it. This morning as I was filling up little vintage glass dessert cups with colorful beads I was feeling very grateful for my life, for my room and for all the creative ideas that rush into my mind. The sun was streaming through the window, and I felt such a sense of wellbeing! I know I am in my right place. Thanks you for coming by! 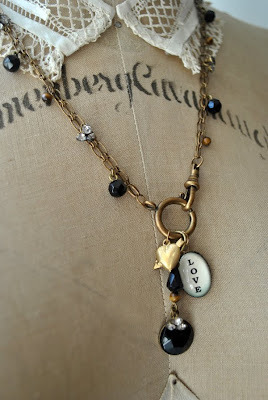 A beautiful necklace for this 'hearts' theme. Wonderful art! Simply stunning! What a beautiful piece of jewelry! I wish I COULD MAKE jewelry!!! This is just lovely and delicate!!! Thank you ladies! And Peggy, just come over and we will make some jewelry! WOW!!! This is fabulous, what a wonderful piece. oh Terri this is just brilliant! I adore all the wonderful details and vintage feel of it. Are you ever going to sell items like this? gorgeous gorgeous art! i LOVE you necklace!! fantastic! and i am still cleaning out my studio...it's been months! i can't seem to part with things...you never know when you might need them! Thank you all for stopping by and for your very kind comments! I will be making more like this one. I may sell on Etsy one day. Martha, I am so glad the bath helped. It sounds like your studio is coming along nicely. I'm anxious to see the finished results...with all the teasers you put here, it's bound to be just splendid! Like your necklace. You're an inspiration! So happy you are feeling joyful in your newly decorated studio , hope you have lots and lots of days like that.